Ned Desmond is COO of TechCrunch. He was also responsible for Crunchbase from April 2012 until September 2015, when Crunchbase spun out of AOL/Verizon to become a standalone, venture-backed company. In the first Crunchbase Women in Venture report (April 2016), our goal was to establish a well-defined baseline against which to measure future progress of women in the venture business. The key finding at the time was that 7 percent of the investing partners at the top 100 venture firms were women. In the 18 months since that report, Silicon Valley has witnessed unprecedented turmoil following a string of public disclosures on sexism, pay discrimination and sexual harassment of women. In response, many investing firms as well as startups have taken steps to improve behavior as well as the diversity of their work forces. As 2017 draws to a close, Crunchbase decided to re-apply the methodology from the 2016 report to see what progress, if any, might be measurable. What follows are the somewhat encouraging results from that updated analysis, as well as a detailed analysis of the firms that are making the biggest impact on the women in venture equation. Among the top 100 venture firms, the percentage of women partners edged up to 8 percent from 7 percent, an increase of 17 percent. Eight firms in the top 100 added a female partner for the first time. Women now hold 15 percent of the partner roles at accelerators and corporate venture firms, a 25 percent improvement in 18 months. Women founded 16 micro-venture funds in the last three years, 21 percent of all the new firms in that category. Ten percent of venture dollars globally between 2012 and Q3 2017 went to startups with at least one woman founder. Sixteen percent of seed dollars globally between 2012 and Q3 2017 went to startups with at least one woman founder. For Crunchbase’s second Women in Venture report, the Crunchbase analytics team followed the same line of analysis as the original report. First, we set out to determine how many women are investing partners at the 100 top venture and micro-venture firms. Second, we examined which venture and micro-venture firms have the strongest track record of supporting startups with at least one female co-founder. To answer the first question, we began by revisiting our list of the top 100 venture firms globally.1 We reviewed our top 100 list to make sure we represented the more active firms in recent years that are leading early-stage venture rounds. As a result of this analysis, 21 new firms joined the top 100 firms for this report.2 The majority of these firms operate outside of the U.S., which is in line with the growth of venture activity we are seeing in both Europe and Asia. Next, we looked at all the men and women listed as “partners” at those firms, and screened that list to ensure they were true “full-time investing partners,” which, in our definition, means the authority to invest the partnership’s funds. We excluded many employees who have a “partner” title but do not invest. We excluded roles that were senior but not on the investing side, including CFO, COO, general counsel and limited partner management. We also excluded other operational roles for talent, scaling and marketing support for portfolio companies. Once we carefully reviewed the data for the top 100 venture firms, we found that 8 percent of the partners, or 64 of 752, are women. That marks a 17 percent improvement over the 54 female investing partners we reported in April 2016, which is clear if very mild progress. Fifty-eight of the venture firms in our updated list have no female partners, which is a bit of an improvement over 62 firms 18 months ago. Eight percent of partners at top 100 venture firms are women, a 17 percent improvement from 18 months ago. 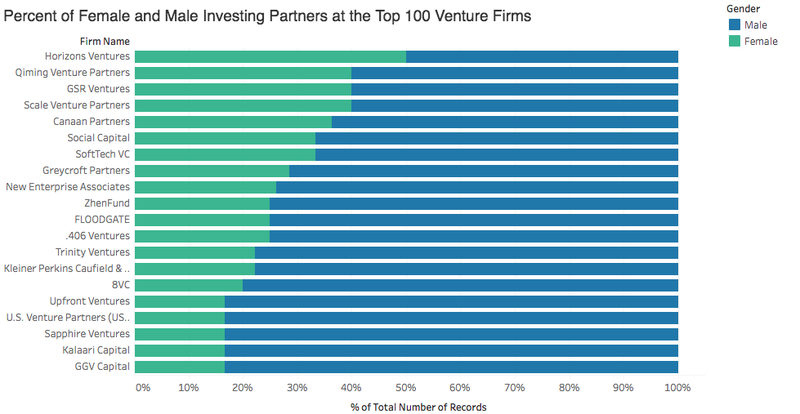 We also looked at which firms have the most female venture partners. At the top of the 42 firms stands NEA (6), Qiming Venture Partners (4) and GSR Ventures (4), both based in China, Canaan Partners (4), and Social Capital (4). A further five firms have two investing partners, and 32 firms have a single female investing partner. The firms that have brought on a female partner for the first time since our last report include Atomico, Benchmark, Bessemer Venture Partners, Lightspeed Venture Partners, Lux Capital, Northzone, Sequoia Capital for their U.S. team and Versant Ventures. When we looked at the male/female ratio among investing partners at the top 100, Horizons Ventures topped the list with 50 percent female partners out of four partners. 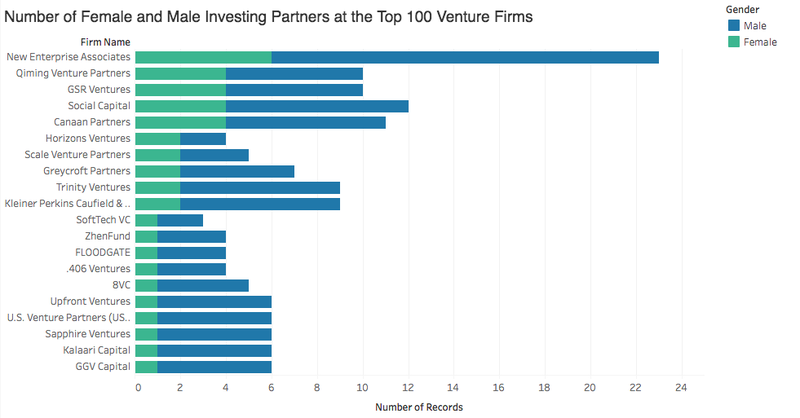 A further 6 of the 100 top firms have 30 percent or more female partners including Scale Venture Partners, GSR Ventures, Qiming Venture Partners, Canaan Partners, Social Capital, and SoftTech VC. Two of these seven firms, Horizons Ventures, and Scale Venture Partners, were founded by women.Three of the seven firms with the highest percentage of female partners are based in Hong Kong or China. As a check on our top 100-firm data, we also looked at a comprehensive list of global venture and micro-venture firms, including all those in Crunchbase that have been active in 2017. When we applied our “investing partner” criteria to those 658 firms, we discovered that 9 percent of partners are women, up from 8 percent 18 months ago. That outcome suggests that the pattern at the top firms is representative across the industry. While improvements at that rate may seem glacial, there are signs of faster change in interesting subsets of the venture world. New firms, for example, have far greater female partner representation. In the last three years, according to Crunchbase data, 21 percent of newly launched venture and micro-venture firms,16 firms in all, had at least one female founder. That is nearly 3x the rate in the top 100 firms. The trend is especially pronounced among micro-venture firms, many started by notable female VCs, including Aileen Lee at Cowboy Ventures, Sonja Perkins at the Perkins Fund, Theresia Gouw, and Jennifer Fonstad at Aspect Ventures, who left established venture firms to start their own firms. These female founding partners, in turn, are clearly more inclined to hire female partners down the line. At the 63 active firms with at least one female co-founder, on average 44 percent of the investing partners are women. We also revisited the data in the corporate venture scene. The 40 corporate venture arms and 87 accelerators active in 2017 showed significant gains for women partners. Women hold 15 percent of the partner roles at both accelerators and corporate venture firms, a 25 percent increase over the 12 percent in our 2016 report. Women now hold 15 percent of the partner roles at both accelerators and corporate venture firms, a 25 percent improvement in 18 months. Finally, we also reviewed female employment broadly speaking at the 459 firms in Crunchbase that have substantial teams and are active. Women now hold down 25 percent of the roles on the investment team at the associate, vice president and principal levels, up from 22 percent in 2016. The increase in women at the more junior roles on investing teams bodes well for the industry moving forward. Do women investors invest in female founders? From our most recent analysis, Crunchbase reported the percentage of funded startups with at least one female founder increased from 9 percent to 17 percent between 2009 and 2017.3 We previously concluded that female founders are gradually doing better when it comes to funding. That data also opened a number of related questions. For example, are some venture firms more likely to fund female entrepreneurs than others? And related to that question, does the presence of female investing partners in a venture firm increase the likelihood of an investment in a female founder? As Crunchbase has a strong data set for female founders, as well as investing partners, answers to these questions are within reach. Between 2012 and Q3 2017, 10 percent of venture dollars globally, a total of $45.9 billion, went to startups with at least one female founder. This represented 4,600 funding rounds or 13 percent of all venture funding rounds with founders listed in Crunchbase. During the same time period, 16 percent of seed/angel funds globally, a total of $3.9 billion in funds, reported at least one female founder. This represents 7,300 rounds or 18 percent of all seed rounds with founders. These numbers establish important guidelines for future analysis, as well as help us understand which firms are more inclined to fund female entrepreneurs. At the top of the list are two firms with female venture partner founders, Kirsten Green at Forerunner Ventures (43 percent in 22 companies) and Freada Kapor at Kapor Capital (37 percent in 37 companies). Other firms that over-indexed include Sherpa Capital at 27 percent (23), Upfront Ventures at 24 percent (20) portfolio companies, Thrive Capital at 24 percent (17), Lux Capital at 24 percent (15), Maveron at 22 percent (16), ZhenFund at 22 percent (18), Canaan Partners at 21 percent (24) and Lerer Hippeau Ventures at 20 percent (35). Of these eight firms, five have female investing partners, including Lux Capital, Upfront Ventures, Maveron, Canaan Partners and ZhenFund. The top six firms with the highest count of female-founded companies, in descending order, are New Enterprise Associates with 63 portfolio companies, Sequoia Capital with 44 companies, Index Ventures with 41 companies, Accel Partners 41 companies, Kapor Capital and GV with 37 companies. Of these six firms, four have full-time female investing partners, namely New Enterprise Associates, Sequoia Capital, Accel partners and Kapor Capital. While those numbers might suggest some correlation between the presence of a female venture and more investments in female sounders, in the larger data picture there is no clear correlation quite yet. There is no difference on average in the number of rounds an all-male firm provide to female founder versus teams with women partners. There is clear evidence, however, that the small number of venture firms with female founders and/or an unusually high percentage of female partners invest at elevated levels in female entrepreneurs. The charts below rank the who’s who of investing in female founders by percentage and by round. By our definition, we count any company that lists at least one female as a co-founder as female-founded. We ran the same analysis on seed investors, where, as we noted above, some 18 percent of all rounds in Crunchbase went to firms with female founders. We looked at firms that closed at least 60 rounds between 2012 and Q3 2017 in companies whose founders we were able to identify in Crunchbase in at least 75 percent of cases. Firms that index over 30 percent include Vegas-based VTF Capital at 38 percent (45 portfolio companies), SOSV at 37 percent (174), Sydney-based Artesian VC at 34 percent (28) and New York-based Collaborative Fund at 32 percent (24). Firms that index over 25 percent include Slow Ventures at 29 percent (49), Rock Health at 29 percent (18), Entrepreneurs Round Table at 28 percent (32), Marc Bell Ventures at 27 percent (36), Great Oaks Venture Partners at 26 percent (50), LaunchCapital at 25 percent (23), Wayra at 25 percent (74) and Right Side Capital Management at 25 percent (49). The majority of these active seed investors do not have female investing partners as noted in the chart below. Firms with the highest count include 500 Startups with 254 companies, Y Combinator with 187, SOSV with 174, Start-up Chile with 94, Wayra with 74 and Startupbootcamp with 54. Two of the three highest in terms of percentage of total rounds in startups with a female founder — Artesian VC and Collaborative Fund — have female partners. On the other hand, the five most active seed investors by round — 500 Startups, Y Combinator, Start-up Chile, Wayra, and Startupbootcamp — each have at least one female investing partner. The charts below rank top seed firms’ investments, by percentage and round, in startups with a female founder. The firms listed made 60 or more investments between 2012 and Q3 2017. In sum, the data suggests some mildly good news about the increasing number of women in the ranks of venture partnerships and a strong sense that new foundations, namely the rise of women starting venture firms, will accelerate that trend in the years to come. Illustration: Li-Anne Dias. Thank you to Angela Peng who created the Tableau charts for this report. This report was launched on October 4th at the Grace Hopper 2017 conference in Orlando, Florida. To benchmark the top 100 firms we reviewed the following activity: fund size, investment cadence in the last five years, count of leading early stage A & B rounds and active in 2017. Twenty-one new firms joined the top 100 firms for this report. They include 406 Ventures, 8VC, Alven Capital, Atomico, Creandum, F-Prime Capital Partners, Global Founders Fund, GSR Ventures, High-Tech Gruenderfonds, Horizons Ventures, Jerusalem Venture Partners, Kalaari Capital, Legend Capital, Magma Venture Partners, Northern Light Venture Capital, Notion Capital, Pelion Venture Partners, Sapphire Ventures, Seventure Partners, Shunwei Capital and ZhenFund. The following firms came off the list, based on the following factors: Firms were either not investing at the same pace in 2017, or not leading early-stage rounds. These firms include Atlas Venture, Avalon Ventures, Azure Capital Partners, BlueRun Ventures, Correlation Ventures, Dag Ventures, Domain Associates, ff Venture Capital, Flagship Ventures, Flybridge Capital Partners, Formation 8, iNovia Capital, InterWest Partners, North Bridge Venture Partners, Oak Investment Partners, Octopus Ventures, Pritzker Group Venture Capital, SV Angel, Technology Crossover Ventures, Ventech and Wellington Partners. For companies with at least one female founder, one-third are made up of teams that have only female founders. Another one-third are teams with two co-founders that include one male and one female. The last third represent teams which have 3+ co-founders with at least one female founder. Two-thirds of these startups, therefore, represent majority or equal female and male-founder representation. This story was updated on Oct 4, 2017, to reflect that we miscounted Canaan’s female investing partners. The correct count is four not the three we originally reported. SOSV was added to the seed investment charts on Oct 17, 2017.